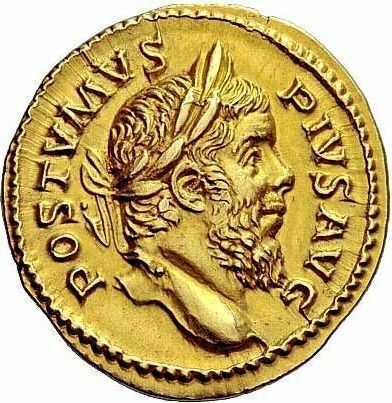 Marcus Cassianius Latinius Postumus was a Roman commander of provincial origin who ruled as emperor in the west. The Roman army in Gaul threw off its allegiance to Gallienus around the year 260, and Postumus assumed the title and powers of emperor in the provinces of Gaul, Germania, Britannia and Hispania, thereby founding what scholars have dubbed the Gallic Empire. Following the victories over Gallienus in 265, the Gallic Empire enjoyed a period of stability. However, in 269 the army in Germania Superior raised a usurper; Laelianus. Although Postumus was able to capture Mogontiacum and kill Laelianus within a few months, he was unable to control his own troops, who wished to put Mogontiacum to the sack. When Postumus tried to restrain them, his men turned on him and killed him.